I frankly never completely bought into The Americans' conceit, that said, the show is intricately structured and features some fantastically fun (and sometimes unexpectedly funny) performances. Every family has a skeleton or two in its closet, but what if that skeleton were in fact a fully flesh and blood body—like a secret identity? While The Americans may seem on its face to be slightly ridiculous, positing a couple of Soviet era KGB agents who have integrated into American society as a typical suburban couple (replete with kids who have no idea of their parents' background), anyone who followed the headlines in 2010 probably remember the so-called Illegals Program, where a slew of Russian agents had in fact matriculated into American society and were attempting to forge relationships with various VIPs not just in government, but in a number of tangentially related fields. There is a copious FBI presence running rampant through The Americans, with the titular spy couple having to cope with a counterintelligence agent moving in across the street from them. Creator Joe Weisberg, a former CIA officer himself, is on the record stating the whole "spy thing" should only be seen as a metaphor, and that his real interest is in depicting the ups and downs of a marriage. That may be one of the more ingenuous assessments in recent memory, since few marriages have to cope with little "problems" like ultimately killing and disposing of a Russian defector they've captured and kept in the trunk of their car for several days while they debate what the best course of action forward might be. The Americans starts with a one two punch that may initially throw viewers for a loop, but which ultimately fits into the overall arc of the show. We see a beautiful young woman, possibly a prostitute, about to earn her living (so to speak), while evidently coaxing state secrets out of her john. She later leaves and ditches what has obviously been a fake blonde wig. Then suddenly we're in the midst of some kind of hit, where a lone man walking down a deserted city street is about to be accosted by two guys who are already nervous because their mark evidently has a reputation for being very skilled at self defense. The mark actually intuits that something bad is about to happen and tries to hightail it out of the neighborhood, which is when all hell really breaks loose, and the woman we've already met arrives to take part in the melée. By the time it's all over, one of the attackers is seriously wounded, and the mark is lying prone on the floor of an improbably huge Oldsmobile sedan, circa late seventies. The visceral intensity of the abduction scene is then contrasted with an almost surreal sequence where we're finally more or less "properly" introduced to suburbanites Elizabeth (Keri Russell) and Philip Jennings (Matthew Rhys), who are living what appears to be a pretty normal early Reagan era existence in an outcropping of Washington, D.C. The Jennings have a typically middle class ranch style home on a typical middle class street, and they have the requisite two children, daughter Paige (Holly Taylor) and son Henry (Keidrich Sellati). The series rather quickly fills in various aspects of the Jennings' backstory, showing them as idealistic young Soviets recruited into a top secret KGB program where they are trained to pass as Americans (the series posits this activity as being in the early sixties, some twenty years earlier than the series' main timeframe, though Russell and Rhys appear to be the same age in both eras). Because their "co-worker" is stabbed in the opening sequence, the Jennings meet their appointed drop off rendezvous to hand off their captive, who is a KGB defector named Timochev. They end stuffing the hapless former spy in the trunk of that aforementioned Oldsmobile. It turns out Philip is posing as an American counterintelligence officer to ferret out information from deep inside the FBI, and he is thus made privy to the fact that their Oldsmobile was spotted at the abduction site, though with fake license plates Philip had put on the car. Things get considerably dicier when an FBI agent named Stan Beeman (Noah Emmerich) moves in across the street and feels that something is "slightly off" about Philip. In the meantime Timochev, pleading for his life, tells Philip the United States government will pay Philip millions to defect and even more millions to return Timochev. The Americans rather smartly plays on the "new Cold War" that began with Reagan's inauguration and the President's proposal of the Strategic Defense Initiative, or so-called "Star Wars" missile defense program. The series is rather ruthless in depicting the rampant espionage that both the Americans and the Soviets engaged in during this era, a complicated labyrinth where neither the Jennings, Beeman nor a number of other interrelated characters, ever truly trusts the people with whom they're interacting and parlaying various state secrets. There's a certain over calculated aspect to the series at times, especially with the neighboring spies and FBI agent, as well as a perhaps too convoluted cascading series of events as the series wends it way through its first season, where a number of betrayals and counter-betrayals may leave some viewers at least momentarily perplexed. While perhaps too overly contrived and even patently unbelievable to be totally compelling (despite its "historically accurate" antecedents), The Americans is often a lot of fun. The Jennings assume a number of sometimes hilarious aliases through the first season, and Russell and Rhys seem to be having a field day playing these multilayered characters. Supporting performances are also uniformly solid, including the seemingly unavoidable Margo Martindale as a "handler" with a few secrets of her own. Erstwhile John-Boy Richard Thomas also turns in some nice guest performances as an FBI agent trying to get to the bottom of the Russian plot to infiltrate American society. 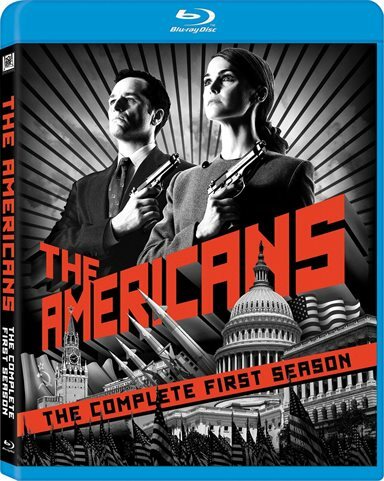 The Americans: The Complete First Season is presented on Blu-ray courtesy of 20th Century Fox Home Entertainment with an AVC encoded 1080p transfer in 1.78:1. This series delights in recreating the "lo-fi" world of the 1980s, and I almost have to wonder if some kind of conscious decision was made to carry that over into the look of this series, for despite being shot with the Arri Alexa, this is one of the more curiously soft, drab, low contrast shows I personally remember having seen recently. Episode after episode is built on scenes shot in what appears to be natural, and often very low, light, adding a murky haze to even daytime interior scenes. Colors are rarely more than anemic, though there are occasional welcome exceptions. The Americans: The Complete First Season features an often nicely immersive lossless DTS-HD Master Audio 5.1 mix that really springs to life in some of the action sequences (like the exciting opening scenes), but which still provides better than average surround activity even in the supposedly calmer domestic environments the series depicts. The Colonel Commentary Featuring Joseph Weisberg, Joel Fields and Noah Emmerich. The exciting season finale gets a fun and informative commentary. There's some funny stuff here (their discussion about the "recaps" is pretty amusing), but there are also some nice honors thrown toward both the cast as well as the crew. Executive Order 2579: Exposing The Americans features a number of interviews that deal not just with this directive but the genesis of the show itself. Perfecting the Art of Espionage focuses on the research the creative team did in order to make the series as accurate as possible. Ingenuity Over Technology looks at the now retro technology on view in the show. I frankly never completely bought into The Americans' conceit, that said, the show is intricately structured and features some fantastically fun (and sometimes unexpectedly funny) performances. This is "high concept" television and that can either mean one of two things: 1) a really distinctive viewing experience, or; 2) jumping the shark sooner rather than later. My hunch is the second season will tell the tale for this fledgling show. Download The Americans: Season One from the iTunes Store in Digial HD.